If your dog has a short muzzle or "squished snout," you may have noticed snoring and breathing issues. If so, your dog might have brachycephalic syndrome, an airway condition that affects certain types and breeds of dog. Brachycephalic syndrome is a combination of upper airway abnormalities that cause partial obstruction to a dog's breathing. The syndrome typically includes the several conditions at once. Elongated soft palate: The soft palate is the soft tissue that lies beyond the hard palate on the mouth. When the soft palate is too long, the end of it extends to the airway. This interferes with the movement of air into the lungs. Everted Laryngeal Saccules: The laryngeal saccules are soft tissue structures near the vocal folds and the larynx (upper part of the trachea, or windpipe). When this airway tissue becomes everted (turned outwards), it gets pulled into the trachea and partially obstructs airflow. Stenotic Nares: In normal dogs, the nostrils are the right size and shape to allow for normal breathing. The term "stenotic" refers to a narrowing or stricture. The term "nares" refers to the nostrils. When a dog's nostrils are narrow or collapse inward when inhaling, it becomes difficult for the dog to breathe through its nose. Many dogs will only have one or two of the above conditions, but they cause enough breathing trouble that they still need to be addressed. In some cases, dogs with brachycephalic syndrome also have a narrowing of the trachea or laryngeal paralysis. The cause of brachycephalic syndrome typically comes down to genetics. The definition of brachycephalic is “short-headed.” Certain dogs have been bred in such a way that they have flat faces, short noses/muzzles, and small or misshapen nostrils. These breeds are often called "brachycephalic dog breeds." Their flat faces and shortened muzzles and noses lead to malformations in their upper airways. Some commonly known brachycephalic dog breeds are Bulldogs, Pugs, Boston Terriers, French Bulldogs, Pekingese, and Shih Tzus. Mixes of these dogs may also have brachycephalic syndrome. Dogs with one or more of the conditions associated with brachycephalic syndrome typically exhibit specific signs that are easily detected. These signs generally become worse after exercise, excitement, or excessive heat or humidity exposure. Obesity tends to make signs worse. If you suspect that your dog has brachycephalic syndrome, it's important that you visit your veterinarian for an evaluation. 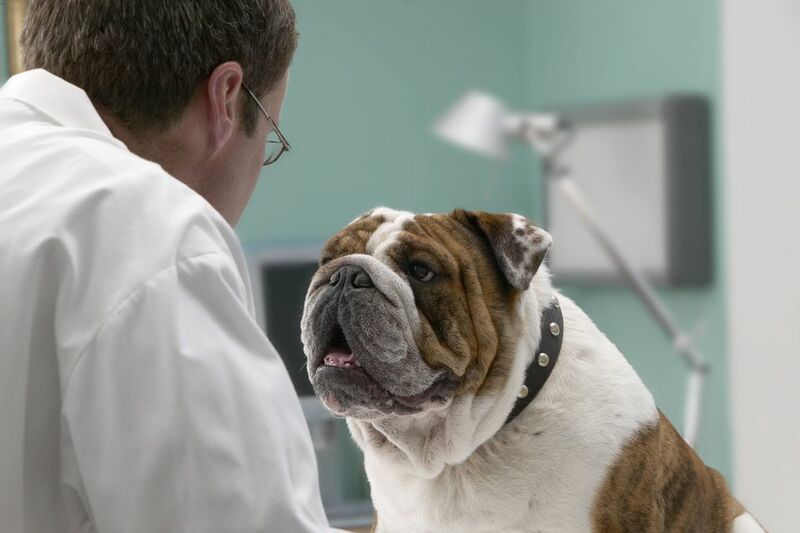 Your vet's office staff will ask a series of questions about your dog's history and signs. Next, your veterinarian will perform a physical examination. Your vet can diagnose stenotic nares during the exam by simply looking at the nostrils. Based upon the dog's history and by listening to breathing, your vet may suspect elongated soft palate and/or everted laryngeal saccules. However, it is very difficult to see the upper airway in an awake dog (the tongue is typically too large and the dog rarely allows a good look). Therefore, the only way to definitively diagnose these is with an upper airway exam while the dog is under sedation. During a sedated upper airway exam, the veterinarian can take the time to look closely at the soft palate and laryngeal saccules to see if there is obstruction of the airway and determine how severe it is. Your veterinarian may also recommend x-rays of the chest to evaluate your dog’s airway, heart, and lungs. Your vet may refer you to a veterinary specialist (usually a surgeon or internist) for further evaluation or treatment. If your dog has brachycephalic syndrome, there are ways you can help. Limit your dog's exposure to heat and humidity. Make sure exercise is not too strenuous and is done indoors or only during cooler times of the day. Use a harness instead of a neck collar to avoid pressure on your dog's airway. Teach your dog to have self-control, keep him calm, and train him to settle down. Excitement can worsen symptoms. In general, there are no medications deemed effective in treating brachycephalic syndrome. If your dog's signs become worse and begin to affect his quality of life, surgery is probably the next step. Airway abnormalities should be treated surgically if they cause distress to your pet, become worse over time, or cause life-threatening obstruction to the airway. Surgical intervention is the only way to significantly treat brachycephalic syndrome. One or more surgical procedures may need to be performed. Soft palate resection (staphylectomy): If your dog has an elongated soft palate, this surgical procedure may be recommended. During a soft palate resection, the surgeon stretches the excess tissue of the soft palate, then trims it away surgically using a scalpel blade, scissors, or CO2 laser. Of course, all of this is done under general anesthesia. Laryngeal Sacculectomy: If your dog has everted laryngeal saccules, they can be surgically removed. Often, this is performed at the same time as the soft palate resection. The surgeon may opt to leave the saccules in place and allow them to return to their normal position now that the palate has been repaired. Stenotic Nares Repair: Surgery can correct stenotic nares. The procedure involves the surgical reshaping of the nostrils to create a larger opening, making it easier for the dog to breathe. Excess tissue may be trimmed away and the remaining tissue tacked with sutures so the nostrils can heal in a more open way. This may also be done at the same time as the above procedures. Some owners choose to have a spay or neuter procedure done at the time of upper airway surgery, especially in younger dogs. Dogs with major brachycephalic syndrome should not be used for breeding. After surgery, your dog must be watched closely. Dogs generally stay in the hospital for one to two days postoperatively. If severe bleeding or inflammation occurs, it can lead to major airway obstruction. In the most serious of cases, some dogs need a temporary tracheostomy (a breathing tube placed into the windpipe via the neck) to allow breathing while the swelling goes down, bleeding subsides, and the upper airway heals enough to allow the dog to breath more normally. It is normal for dogs to cough and gag after surgery while they are recovering. This should subside as your dog heals. In serious cases, the dog may have too much airway damage and the surgery will not correct the breathing issues. This may result in the placement of a permanent tracheostomy tube. Fortunately, this scenario is uncommon. Most dogs make a full recovery after airway surgery and go on to live normal lives. There may be some residual snoring and audible breathing, but it is generally much milder than before.